The University of Chicago Contemporary Chamber Players (also called Contempo, CCP, or Contemporary Chamber Players of the University of Chicago) is an American ensemble dedicated to the performance of contemporary classical music. 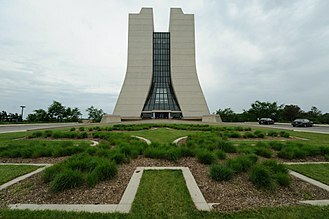 It was founded in Chicago in 1964 by the American composer Ralph Shapey. Its artistic director is the composer Shulamit Ran. The ensemble has presented the world premieres of over 80 compositions, by composers including Roger Sessions, John Harbison, Ralph Shapey, George Perle, Shulamit Ran, and John Eaton. In October 2004 the group announced that, in recognition of its 40th anniversary, it would henceforth be known as "Contempo." ^ Carnig, Jennifer (October 21, 2004). "Contemporary Chamber Players begin next 40 years as Contempo". chronicle.uchicago.edu. Retrieved August 11, 2018. The University of Chicago Divinity School is a private graduate institution at the University of Chicago dedicated to the training of academics and clergy across religious boundaries. Formed under Baptist auspices, the school today lacks any sectarian affiliations, the school offers courses leading to the Ph. D. Div. /A. M. With the Irving B. Harris School of Public Policy Studies A. M. R. S. /J. D, with the University of Chicago Law School M. Div. /A. M. Kitagawa, the Dean of the Divinity School from 1970 to 1980, the Institute for the Advanced Study of Religion officially opened in October 1979, with Professor Marty as its director. The program sponsors workshops and seminars throughout the academic year, affiliated faculty include Daniel A. Arnold, Steven Collins, Paul Copp, Matthew Kapstein, James Ketelaar, Gary A. Tubb, and Christian K. Wedemeyer. Completed in 1926, Swift Hall was designed by Coolidge and Hodgdon in the collegiate Gothic style of architecture and it contains lecture halls, seminar rooms, faculty offices, a student-run coffee shop, a commons, and administrative offices. The lecture hall was formerly the home of the Divinity Library, before its holdings were consolidated into the research library. Southwest of Swift Hall and connected to it by a beautiful stone cloister is the Joseph Bond Chapel, both Swift Hall and Bond Chapel were designed by the architects Coolidge and Hodgdon at the end of the Gothic revival period in America. The Chapel was given by Mrs. Joseph Bond in memory of her husband, a former Trustee of the Baptist Theological Union, the predecessor institution of the Divinity School. Mr. and Mrs. Bonds daughter, married Edgar J. Goodspeed, after her death in 1949, Mr. Goodspeed donated the stained-glass windows in her memory. The cornerstone of the chapel was laid by Mrs. Bond on April 30,1925, in 2012-13, the Chapel was renovated and its organ was replaced by the Reneker Organ. It was dedicated in 1984 in honor of the late Robert W. Reneker and was moved to Bond Chapel in the autumn of 2012. The cloister connecting Bond Chapel to Swift Hall was reconstructed in 2014, a cloister garden is due to be installed between Swift and Bond in 2015. Two years after the bankruptcy of the original University of Chicago, supporters began raising money for a successor. The new school opened its doors in 1890, after the old school was renamed as the Old University of Chicago. Established by oil magnate John D. Rockefeller and the American Baptist Education Society, William Rainey Harper became the first President of the University of Chicago in 1891 and its first classes were held in 1892. It has been coeducational since its founding, the University has begun major campus expansion projects. The second University of Chicago was founded in 1890 by the American Baptist Education Society and oil magnate John D. Rockefeller, the University of Chicago held its first classes on October 1,1892. The original tract of land, comprising the current main quads, was donated by Marshall Field, owner of the Marshall Field, the modern university emerged from a bankruptcy reorganization of the predecessor institution of the same name, renamed as the Old University of Chicago. 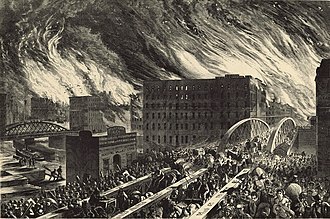 The earlier institution was founded by prominent members of the Chicago and greater Illinois community including Justice Stephen A. Douglas, graduates of the Old Chicago University were assimilated into the ranks of the alumni of the University of Chicago. The Universitys founding was part of a wave of university foundings that followed the American Civil War, incorporated in 1890, the University has dated its founding as July 1,1891, when William Rainey Harper became its first president. The first classes were held on October 1,1892, with an enrollment of 594 students, earlier references to University of Chicago rise from the incorporation of the first University of Chicago, which Senator Stephen A. Douglas started with an 1856 grant. 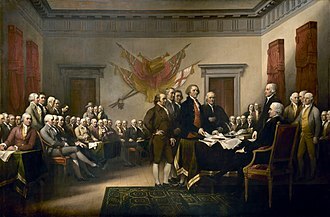 Though Rockefeller was urged to build in New England or the Mid-Atlantic region of the United States and his choice reflected his strong desire to realize Thomas Jeffersons dream of a natural meritocracys rise to prominence, determined by talent rather than familial heritage. Rockefellers early fiscal emphasis on the physics department showed his pragmatic, yet deeply intellectual, and yet, although founded under Baptist auspices, the University of Chicago has never had a sectarian affiliation. The business school was founded thereafter in 1898, and the law school was founded in 1902, Harper died in 1906, and was replaced by a succession of three presidents whose tenures lasted until 1929. During this period, the Oriental Institute was founded to support, unlike many other American universities at the time, the University of Chicago thus came to revolve around a number of graduate research institutions, following Germanic precedent. 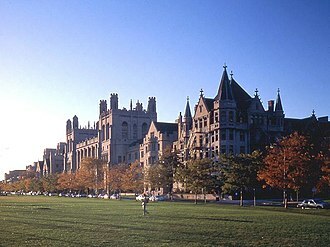 The College of the University of Chicago remained quite small compared to its East Coast peers until around the middle of the 20th century, the student-to-faculty ratio is 4,1, one of the lowest amongst national universities, and all faculty members are required to teach undergraduate courses. The schools traditions of rigorous scholarship were established primarily by Presidents William Rainey Harper, Chicago opened its door to women and minorities from the very beginning, a time when they seldom had access to other leading universities. Amos Alonzo Stagg Field is the name of two different football fields for the University of Chicago. The earliest Stagg Field is probably best remembered for its role in a scientific achievement by Enrico Fermi during the Manhattan Project. The site of the first artificial nuclear reaction received designation as a National Historic Landmark on February 18,1965. 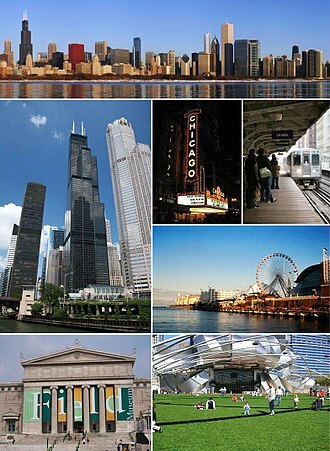 On October 15,1966, which is the day that the National Historic Preservation Act of 1966 was enacted creating the National Register of Historic Places, the site was named a Chicago Landmark on October 27,1971. A Henry Moore sculpture, Nuclear Energy, in a small quadrangle commemorates the location of the nuclear experiment, the Universitys current Stagg Field is located a few blocks away and reuses one of the original gates. Chicago Pile-1, the worlds first artificial nuclear reactor, was built under the west stands of Stagg Field, the first man-made self-sustaining nuclear chain reaction occurred on December 2,1942. The first Stagg Field was a stadium at the University of Chicago in Chicago and it was primarily used for college football games, and was the home field of the Maroons. Stagg Field originally opened in 1893 as Marshall Field, named after Marshall Field who donated land to the university to build the stadium, in 1913, the field was renamed Stagg Field after their famous coach Amos Alonzo Stagg. The final capacity, after several expansions, was 50,000. The University of Chicago discontinued its program after 1939 and left the Big Ten Conference in 1946. The stadium was demolished in 1957, and much of the site was re-utilized as the site of Regenstein Library. In addition to Maroons football, the stadium hosted other events. These include the 1936 US Olympic Trials for Track and Field held June 19–20,1936 and the NCAA Mens Track and Field Championships in 1921,1922,1923,1929,1930,1931,1932,1933, Northwestern played a number home games at Stagg Field. At the turn of the 20th century, Northwestern was unable to handle large crowds, so they hosted then-powerhouse Minnesota at Marshall Field for a 1901 game, in 1925 Northwestern again was unable to accommodate large crowds, and as a result played two games at Stagg Field. Housing at the University of Chicago includes 12 residence halls that are divided into 38 houses. Each house has an average of 70 students, freshmen must live on-campus, and housing is guaranteed but not required thereafter. The University operates 28 apartment buildings near campus for graduate students, in 2014, 54% of undergraduates lived in college-owned housing. Gates-Blake and Goodspeed Halls opened in 1892 as the first residence halls for the University of Chicago, the buildings were designed by Henry Ives Cobb and served as dormitories for divinity school and graduate students. The buildings feature oriels along their facades and gables along the line that are signs of the Chicago Gothic architecture. The first womens dorm, Foster Hall, opened in 1893 and it was converted to offices in 1961-62. Burton–Judson Courts is located at 1005 E. 60th St. and it was designed by the Philadelphia firm of Zantzinger and Medary. Burton-Judson was the first on-campus residence of eminent astronomer Carl Sagan, burton-Judson contains six houses, Dodd-Mead, Linn-Mathews, Coulter and Vincent. Campus North, which occupies the location of Pierce Tower, was built from 2013 to 2016. With 15 floors, it has room to accommodate about 800 students, the hall contains eight renamed houses of the recently closed Breckinridge, Maclean, New Grad, and Blackstone halls. The building is one of Studio Gang Architects many recent contracts in, the International House contains undergraduate and professional students. International House is colloquially known by students as I-House, facing the Midway Plaisance, it was created in 1932 as a gift from John D. Rockefeller, Jr. specifically to foster relationships between students from different countries. It is notable for having housed many artists, scientists. Some 40,000 people have lived there since it first opened its doors, I-House Chicago is a member of International Houses Worldwide. The International House subsequently embarked on a $30 million renovation project, until autumn 2013, undergraduates lived in two houses located in the East Tower of International House and Phoenix. The Joseph Regenstein Library is the main library of the University of Chicago, named after industrialist and philanthropist Joseph Regenstein. It is one of the largest repositories of books in the world and is noted for its brutalist architecture, the library stands on the former grounds of Stagg Field. In 1965, the Joseph Regenstein Foundation gave $10 million to the University for construction of the library, in 1968, the university broke ground and, in 1970, the library opened at the final cost of $20,750,000. The building was designed by the Chicago firm Skidmore, Owings & Merrill led by senior architect Walter Netsch and it is built out of grooved limestone, from a distance, resembles concrete. University tour guides often remark on the resemblance between each of the elements of the facade and the fore edge of a book. The University of Chicago Graduate Library School was housed in the Joseph Regenstein Library until its closure, the building has five floors above ground and two basements. Each floor has a reading room in the center with desks, group study rooms, lockers. The reading room on floors two and three is connected by a small atrium, the reading rooms are separated from the stacks, located on the west side of the building, so that the stacks can be maintained at lower temperatures, which are more amicable to book conservation. 220 faculty studies line the east side of the building, the Regensteins overflowing collection posed space problems for the book stacks. In May 2005, the University of Chicagos Board of Trustees authorized funding for a $42 million addition to the library and it allows the library to maintain physical copies of materials available online while creating space within the book stacks to accommodate approximately 20 years of new print acquisitions. Were a campus where the library is sort of the center because it is the focus. The Regenstein Library is the location of the Special Collections Research Center, which houses rare book collections, the SCRC was established in 1953 by Herman H.
The University of Chicago Law School is the graduate school of law at the University of Chicago. It was founded in 1902 by a coalition of donors led by John D. Rockefeller, U. S. News & World Report ranks Chicago fourth among U. S. law schools, and it is noted for its influence on the economic analysis of law. It is ranked 12th in the 2016 QS World University Rankings, the ABA disclosures indicate that 75% of Chicago graduates earned starting salaries of $160,000 or greater upon graduation. The law school was ranked #3 of all law schools nationwide by the National Law Journal in terms of sending the highest percentage of 2015 graduates to the largest 100 law firms in the US. During that time Beale hired many of the first members of the law school faculty, the Law School experienced a period of profound growth and expansion under the leadership of Dean Edward Hirsch Levi, AB1932, JD1935. Levi served as university Provost and President, and as United States Attorney General under President Gerald Ford, during his time at the Law School, Levi brought scholars to the faculty and supported the Committee on Social Thought graduate program. Legal History Program The John M. Renovated in 2006, it features a reading room. The Law Library is open 90 hours per week and employs the equivalent of 10 full-time librarians and it has study space for 483, a wireless network, and 26 networked computers. Admission to The University of Chicago Law School is highly selective, for the class entering in the fall of 2015,900 out of 4,111 applicants were offered admission, with 183 matriculating. The 25th and 75th LSAT percentiles for the 2016 entering class were 166 and 172, the 25th and 75th undergraduate GPA percentiles were 3.69 and 3.97, with a median of 3.90. The University of Chicago Law School employs a system that places students on a scale of 155-186. The scale was 55-86 prior to 2003, but since the school has utilized a prefix of 1 to eliminate confusion with the traditional 100 point grading scale. These numerical grades convert to the more familiar alphabetical scale roughly as follows, 155-159 = F, 160-167 = D, 168-173 = C, 174-179 = B, 180-186 = A. The David and Alfred Smart Museum of Art is an art museum located on the campus of the University of Chicago in Chicago, Illinois. The permanent collection has over 15,000 objects, the Smart Museum and the adjacent Cochrane-Woods Art Center were designed by the architect Edward Larrabee Barnes. The University of Chicago began seriously planning to build an art museum, the founding gift came from the Smart Family Foundation in 1967 and construction began in 1971. The museum was named after David A, Smart and his brother Alfred Smart, the Chicago-based publishers of Esquire, and, with Teriade, Verve, as well as the founders of Coronet Films. David Smart was an art collector and owned paintings by Picasso, however, the founding gift was of Esquire stock and did not include any works from his personal collection. Instead, the collection was assembled from a variety of sources, including works of art in various university departments and gifts from foundations. The Smarts founding director was the art historian and professor Edward A.
Maser, in 1983, the museum became a separate unit of the university devoted to serving the entire community, including educational outreach activities in local public schools. In its early years it was known as the Smart Gallery but was renamed the David, there are over 15,000 objects in the Smart Museums collection. A selection is displayed in four permanent collection dedicated to modern art, Asian art, European art. The collection is often used in special exhibitions and for courses taught at the University of Chicago. Memorial Collection includes sculpture by Jean Arp, Edgar Degas, Henry Moore, Jacques Lipchitz, one of the most notable items in the collection is the original dining room furniture designed by Frank Lloyd Wright for the Robie House, which is more or less on permanent display. Most of the original Robie House furniture as well as a few window casings were transferred into the collection before it opened in 1974. At that time, the Robie House was still being used as offices for the University of Chicago, the Asian collection includes literati scroll paintings from China and Korea, Buddhist sculpture and ukiyo-e prints. The Oriental Institute, established in 1919, is the University of Chicagos interdisciplinary research center for ancient Near Eastern studies, and archaeology museum. It was founded for the university by professor James Henry Breasted with funds donated by John D. Rockefeller and it conducts research on ancient civilizations throughout the Near East, including at its facility, Chicago House, in Luxor, Egypt. The Institute publicly exhibits a collection of artifacts related to ancient civilizations at its on campus building in the Hyde Park. James Henry Breasted built up the collection of the universitys Haskell Oriental Museum, which he oversaw along with his field work, as World War I wound down, he sensed an opportunity to use his influence in the new political climate. He wrote to John D. Rockefeller, Jr. and proposed the foundation of what would become the Oriental Institute. Fundamental to the implementation of his plan was a trip through the Middle East. Breasted received a reply from Rockefeller pledging $50,000 over five years for the Oriental Institute, Rockefeller assured University of Chicago President Harry Pratt Judson that he would pledge another $50,000 to the cause. The University of Chicago contributed additional support, and in May 1919 the Oriental Institute was founded, the Institute is housed in an unusual Art-Deco/Gothic building at the corner of 58th Street and University Avenue, which was designed by the architectural firm Mayers Murray & Phillip. Construction was completed in 1930, and the building was dedicated in 1931, in the 1990s, Tony Wilkinson, founded the Center for Ancient Middle Eastern Landscapes based at the institute. Its role is to investigate the Middle East through landscape archaeology, the Museum of the Oriental Institute has artifacts from digs in Egypt, Syria, Turkey and Iran. The museum has free admission, although visitors are encouraged to donate US $10.00 for adults, the Oriental Institute is a center of active research on the ancient Near East. The buildings upper floors contain classrooms and faculty offices, and its gift shop, in addition to carrying out many digs in the Fertile Crescent, OI scholars have made contributions to the understanding of the origins of human civilization. Bartlett Gymnasium is a former athletic facility on the campus of the University of Chicago in Chicago, United States, that has been converted into a campus dining hall. Construction of the building took place between November,1901 and January,1904 on land owned by the university, the cost of construction, was covered by Hibbard, Bartlett & Company owner Adolphus C. The gymnasium was built as a memorial for A. C. Bartletts son, Frank Dickinson Bartlett, upon completion, the Gothic style building was 200 feet by 80 feet with 2 stories and a basement. This gym includes a 12 foot wide, 1/13 of a mile, the ground floor contained locker rooms, faculty exercising room, a 60 foot long by 28 foot wide swimming pool and offices. The basement was focused on specialized rooms for athletic teams, in 1932, the team moved into the newly built Henry Crown Field House, and the building became underutilized and fell into disrepair. In 2002, the gymnasium was remodeled to become a dining hall. Upon its completion, the gymnasium contained a mural within the front entrance hall created by Frederic Clay Bartlett, the mural depicts Athletic Games in the Middle Ages with the participants dressed in appropriate attire. The gym included the Bartlett Memorial Window, presented to the university by William Gold Hibbard, the stained-glass was taken from Walter Scotts Ivanhoe and represents Rowena crowning Ivanhoe at the close of the second days tournament at Ashby de la Zouche. The window was designed and drawn by Edward P. Sperry, over 15,000 pieces of glass were used in the construction of the window. The window was placed above the entrance of the gymnasium. In 2001, during the renovation of the gymnasium, the university removed the stained-glass with a promise to restore, the dedication ceremony took place immediately following the annual football dinner hosted by President Harper. Addresses to the included, The Presentation Address by Adolphus C. The presentations took place on the floor of the new gymnasium. The invocation was given by Reverend Professor Edward Judson D. D. of the Divinity School followed by the previously mentioned speeches, following the addresses, a reception, hosted by President and Mrs.
Argonne's IBM Blue Gene/Q supercomputer. 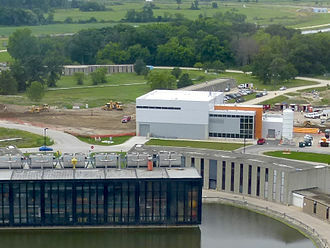 Argonne's Center for Nanoscale Materials. 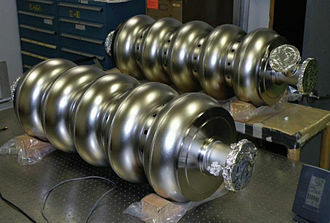 A student examines Argonne's Gyro Wheel at the Open House. John D. Rockefeller founded the University of Chicago along with the American Baptist Education Society. Ryerson Physical Laboratory, located on the Main Quadrangles. The Rockefeller Chapel, the tallest structure on campus. Laird Bell Quadrangle fountain in front of the D'Angelo Law Library. Judd Hall as visible from the adjacent Charles M. Harper Center. The front door of the Orthogenic School's former building, with the iconic "yellow door" that has become a trademark of the school. This drawing by Frederic Clay Bartlett was utilized by Edward Peck Sperry while creating the Frank Dickinson Bartlett Memorial Window.